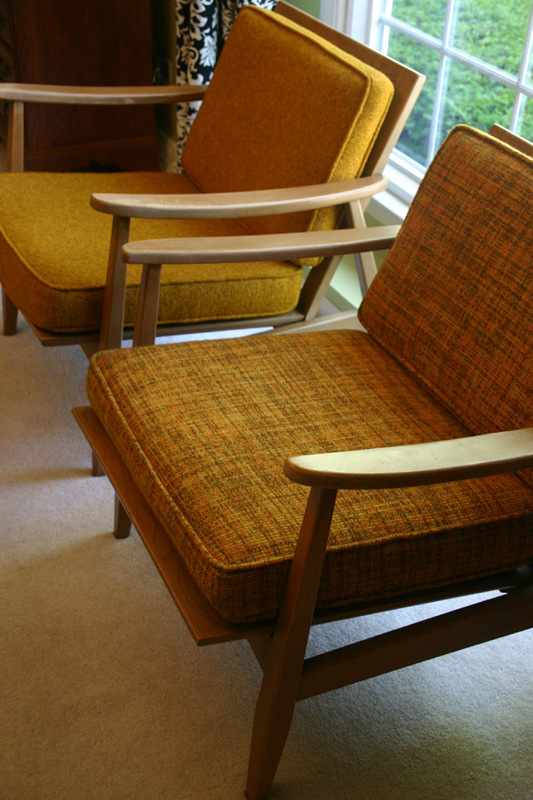 Lucky people can occasionally find these at garage sales for $50-$150 per chair. But the world has gotten so savvy, and the midcentury style is so "in" that it gets harder and harder to get lucky. And the upper limit of my chair budget is $50, so it's unlikely that I'm to get SO lucky. Not my dream chair, but a decent chair in decent condition, and with a little crafty TLC it could become a truly excellent piece. I took it home and gave it a thorough scrubbing with Folex (that stuff is MAGIC, by the way) and as soon as there was a spare penny in my budget, I ordered Legs and Mounting Plates, which finally arrived yesterday! It was attached with just 4 screws! Took about 5 minutes to get them all out with a screw driver. The whole new-leg process would have taken about 5 minutes if I'd had a drill, but my drill is still in the yarn shop and so I was forced to use a screwdriver and some elbow grease. The plates screwed right in through the existing fabric and into the wood frame, super easy. And the legs screwed right into the plates! I spent about 45 seconds thinking about the placement of the back legs, because the back of the chair is curved, and I didn't want to end up with a chair that wanted to tip over (either backwards or to the side). But that was resolved easily enough. And voila! Chair with legs! Now I can sit without getting vergito. The chair is about 2" higher than it was, which is an (intentional) improvement, cos it was a bit low before. Cost so far: $22.76 including shipping, plus a bottle of Maker's Mark for the friend with a truck who drove the chair to my house (roughly another $22). Next step will be sewing a slipcover from a fabric that is NOT a cat-hair magnet. Because Howard is convinced that this is his chair. At least now it doesn't tip over every time he leaps into it! Nice job!! What a great DIY project! !